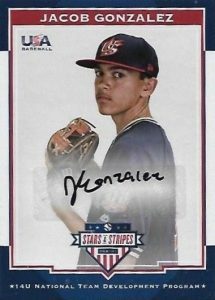 Back on the diamond after a short hiatus, 2017 Panini Stars and Stripes USA Baseball offers a detailed account of the United States national team across several age levels. Every pack yields one autograph or relic, with a total of five hits per hobby box. The 100-card base set features both current players and esteemed alumni. This includes many projected to be first-round selections in the 2017 MLB Draft. These are joined by various parallels, like Longevity Holo Foil, that combine to fall in every pack. 2017 Panini Stars and Stripes USA Baseball also packs in a lot of hit options. On-card versions include Alumni Signatures along with National Team Signatures and Dual Signatures for College and 18U players. Each of these inserts add rare Red and Green Ink parallels while the National Team Signatures can also be found with limited Black Ink versions. Providing more signed choices for the College and 18U teams are Stars & Stripes Signatures cards that also include limited relic parallels. Expanding the checklist even more, Jumbo Swatch Silhouette Signatures inserts showcase top college, 18U, 17U, 15U, 14U and alumni players. Parallels include various pieces of premium memorabilia as well as Gold Ink versions. 2017 Panini Stars & Stripes Quentin Holmes Jumbo Swatch Auto Prime 25 INDIANS! JEREN KENDALL 2017 Panini USA Stars & Stripes Auto Patch 99 DODGERS! MINT! BASE LONGEVITY PARALLEL CARDS: Longevity, Holo Foil #/99, Team Logo Gold #/25, Stars Platinum #/10, USA Flag Black #/5, Printing Plates 1/1 (Base Set). LONGEVITY BASE PARALLEL CARDS: Longevity, Ruby #/249, Sapphire #/49, Emerald #/5. 91 cards. Shop on eBay. PARALLEL CARDS: Prime #/25 or less, Buttons #/8 or less, Laundry Tag #/8 or less. 124 cards. Shop on eBay. PARALLEL CARDS: Black Ink #/25*, Red Ink #/10, Green Ink #/5. 23 cards. Serial Numbered #/499. Shop on eBay. 4 cards. Serial Numbered #/25. Shop on eBay. 15 cards. Serial Numbered #/199. Shop on eBay. PARALLEL CARDS: Prime #/5 (*Card #8 - #/25). Cards #11-13, #15 not found in Prime parallel. PARALLEL CARDS: Prime (Cards #1-5 - #/5, Cards #6-8 - #/25). 198 cards. Shop on eBay. PARALLEL CARDS: Prime (Cards #1-65 - #/10; Cards #92-200 - #/5). Getting a little out of hand with the 14 and under autos. 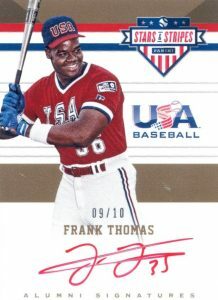 I’m ok with the college and USA autos because it’s fun to see if you got a guy that five years from now will be a pro. I like following my big hits in the box I get to see if he turns into someone big. But the guy isn’t even in high school. 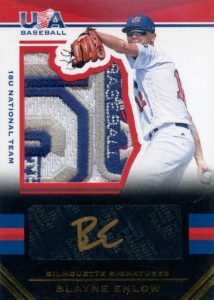 So what is next the Little League World Series Autos. We need someone to tell them stop this isn’t adding value to the product and you’re just using it to fill boxes. So you don’t have to spend too much on top names if you can get a bunch of 14 year olds to sign for free and still market the boxes at $$$$. Still buying the product but disappointed that it got on Panini’s radar since years back it was a good value with big hits. Now I’m just waiting for the boxes full of junk and prices to go up. When will collector catch a break. My 4 boxes had 6 hits each. So, that’s nice. 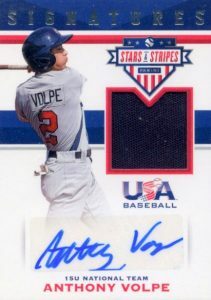 For people that like to collect the very young player autos, 14U, 15U, etc., it’s a nice product to hold and see who turns into a star, if any of them. But, like mentioned above, way too many of those players. And, what does “Developmental Program” mean for the super young guy hits? Just doesn’t do it as far as price point goes for the product, imo. My 10 year old used his birthday money to buy a box of these because they were labeled 2017 USA baseball. His expectation was to see players who were actually on team USA this spring even if the pictures were not from the actual games. 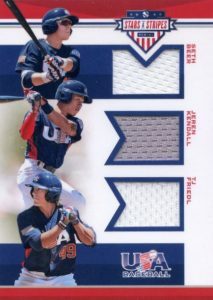 It feels pretty sketchy for Panini to slap USA baseball all over the box charge about two bucks per card and include a bunch of kids no matter how good they are. He was looking for the instant gratification of seeing great players like Arenado not wait 10 years to find out if he got a good card. Save your money. Panini should be ashamed. I broke 2 boxes and overall I enjoyed the break. Some guys I’ve heard of and some guys I haven’t heard of. Each box had 6 hits. One of the autos (Brice Turang #’d/499 on card auto) is inscribed “Go for Gold”. I haven’t come across any others that have this inscription and didn’t see anything in the checklist referencing inscriptions. Do you have any knowledge or info? Thanks.